Rumors of a new LG Windows Phone handset have persisted for years, but now it seems we've finally caught a glimpse of one. 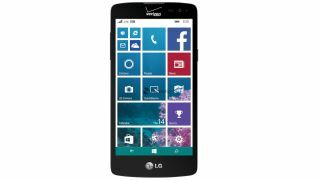 This is LG's new Windows Phone, which will launch on Verizon in the US, according to Neowin. There's not much to glean from the image, besides that the phone has virtual buttons and apparently runs Windows Phone 8.1, not Windows 10 for phones. That's led to speculation that the new LG Windows Phone could arrive soon - before Windows 10's launch, at least - but nothing is certain. The lone other clue is the filename of the image Neowin received: "Lancet." Whether that's a code name or nothing at all is unclear. LG's last Windows Phone device, the LG Optimus 7, was quite impressive back in 2010, but the landscape has changed so much since then it's hard to know what will happen this time around.